Unfortunately, many adults aren’t completely satisfied with the way that their smile looks. From just simply thinking that their teeth are a bit crooked to having to hide their mouths with their hand when they laugh or smile, there’s a feeling that their smile is a detriment and not the asset that it should be. Thankfully, at The Braces Place, we’re here to help! With our orthodontic treatment that we provide for our adult patients, we’re capable of giving you a beautiful smile that you’ve always desired. While healthy teeth are able to be moved at any age, there are still some differences between adult orthodontic treatment and earlier treatment. One of the main reasons is that growth and development of an adult’s jaw is already completed, which means that structural changes in the jaw can’t be accomplished with orthodontic appliances like they can with a child. Also, adults are more likely to have periodontal disease. This is problematic because this disease will damage the gum tissues. If a patient’s gums aren’t healthy during orthodontic treatment, bone loss can occur and weaken a patient’s dental health over time. Before treatment can start, it’s necessary for gum disease to be under control. Traditional Metal Braces — These are the most common type of orthodontic appliance and also the one you’re likely to be most familiar with. 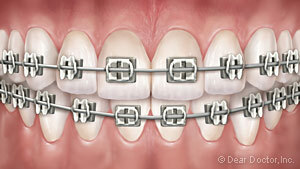 Traditional metal braces utilize small metal brackets that are bonded to the front of each of a patient’s teeth. A thin wire runs through each of them and is attached on either end to metal bands that will go around one of the back molars. Over time, this wire will slowly pull the metal brackets – and the teeth that are attached to them – to create a much more favorable alignment for the patient’s teeth. Clear Braces — These work just like metal braces and are very similar to them, but with one clear difference – the brackets are made of ceramic, plastic, or a combination of them. This clear color will allow the brackets to blend into the natural color of the teeth, allowing for a more discreet orthodontic treatment that you won’t get with traditional braces. While they provide a more attractive look, they also aren’t as durable as metal brackets and they’re more likely to break. 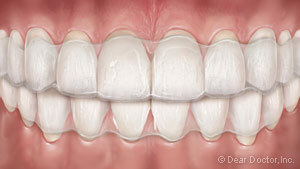 Clear Aligners — Clear aligners, also known as Invisalign, are essentially the alternative to braces. Instead of using brackets and wires to shift a patient’s teeth, Invisalign uses clear aligners to straighten a patient’s smile. 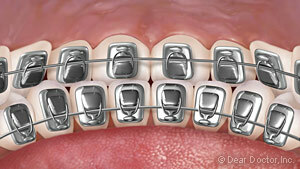 A series of aligners will be provided and you’ll have to wear each set for two weeks in a designated order. As you swap out each set of aligners for a new one, your teeth will gradually move into their best position. Our Invisalign treatment isn’t for all patients so come and visit us sometime to see if you’re a suitable candidate. 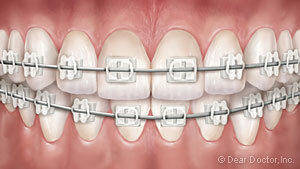 Lingual Braces — These work similarly to metal braces, but instead of being bonded to the front of your teeth, lingual braces are bonded to the back of them. While this is perhaps the most discreet orthodontic appliance around, it’ll take more time to get used to and it’s also more expensive. After you’ve finally finished whichever treatment you’ve undergone (metal braces, Invisalign, etc. ), you’ll have to move onto the next stage. That’s right – there’s still one more part to go! This is known as the retention stage. Wearing a retainer afterward is crucial because it will help keep your teeth in place while new supporting bone can develop around them in their new positions. If the supporting bone isn’t allowed to grow, the teeth can shift back toward their original, unfavorable positions – something you certainly don’t want to see happen after all of the time and hard work you put in! We’ll instruct you as to how often you should wear your retainers so that you can retain your new and beautiful smile for many years to come! If you’re interested in our Lexington, SC Invisalign, metal braces, or other orthodontic treatments, we encourage you to sign up for a complimentary consultation by giving us a call at (803) 359-4480. Alternatively, you can fill out our online appointment request form. We hope to see you soon and give you the beautiful smile that you’ve always wanted!